Zappos has always taken its "Delivering happiness" mantra seriously, at least where customers are concerned. To express it this holiday, and alongside agency Mullen Lowe, it pulled a stunt that's almost sure to guarantee social newsfeed love: Thirty employees visited Hanover, a small New Hampshire town, in the dead of night to drop big boxes of gifts on the doorsteps of every house. Hanover, recognized by Zappos as "fiercely loyal" to the brand compared to other communities its size, is considered one of New Hampshire's wealthiest communities, and was once dubbed the best place to live in the state by a site called Road Snacks (not to mention one of America's prettiest towns). It's also got a really high college student population, being home to a little-known institution called Dartmouth. Now it's got free presents, to boot. Talk about Whoville—this is one town you can tell St. Nick to skip. About 1,900 boxes were dropped, each filled with an assortment of products for the whole family—headphones, backpacks and other warm-weather gear, perfect for Hanover residents facing a Northeast winter. At dawn, the video claims, the Zappos crew vanished into the blue—making it unclear who recorded this footage (a grateful Mrs. Claus? ), or even why they branded the transport-and-getaway truck with the hashtag #ZapposLovesHanover, which ostensibly few would have been able to see at the time it was in movement (late at night, then early morning). But hey, these questions are just window dressing. We all know this was all done for Interactions! 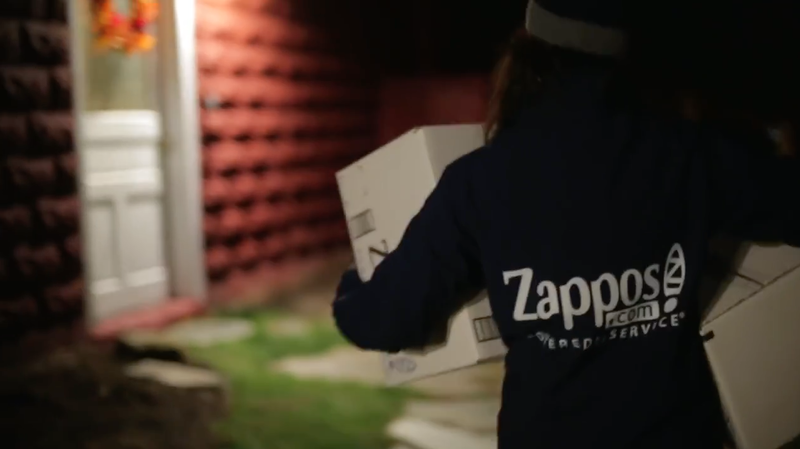 The message, wethinks, is clear: Zappos delivers happiness. So if you'd like the company to pull a Hanover in your town, maybe it's time to bring the local chiefs together and orchestrate a long-term strategy to systematically replace all your shoes. You can call it Operation: Grinch Hanover.